Bandon Tidy Towns and the Transition Town Bandon Group joined together on Friday, 12th March, 2010 and planted over 100 native trees on the Bandon By Pass as part of National Tree Week. A big thank you to volunteers from Cope, the Rosmini Centre, Colaiste na Tobhairte and St Brogans who all helped with the project. 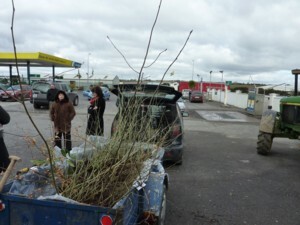 A further 200 trees will be planted next Friday, 19th March which will complete the project. This entry was posted on March 13, 2010 at 6:01 pm and is filed under bandon, tidy town, tree planting. You can follow any responses to this entry through the RSS 2.0 feed. You can leave a response, or trackback from your own site.